Get the food ready, unpack your Ram apparel and lower the tailgates. I, being a baseball romantic, still held out hope until yesterday's game. The Cardinals had just defeated the San Diego Padres over the weekend, three games to one and had narrowed the Cincinnati Reds' lead to six games. But reality set in when the Redbirds bats disappeared again in Florida as the Marlins shut them out 4-0. St. Louis is now 6 games back of the Cincinnati Reds, who's magic number is now down to 6. While Cardinal nation has every right to point fingers and assign responsibility for this clubs sudden collapse. The answer is very simple. The Cardinal offense. Through 149 games this season the supposed talent rich roster has managed to be shut out 13 times. Scoring just 1 run in 17 other contests and managing to tally an anemic 2 in 21 other games. In the now famous words of Jack "The Ripper" Clark, that is pathetic. Remember that the Deadbirds have participated in 149 regular season contests thus far. And in over ONE THIRD of those affairs have managed 2 runs or less! That is why Busch Stadium will be empty in October. In 51 games this season St. Louis has scored less than 3 runs. Couple that with a 16-26 record against Chicago, Houston and Milwaukee, three teams in the Central Division that each have a winning percentage below .500, and you have the recipe for failure. Another glaring weakness was this teams inability to hit with runners in scoring position. The Cardinal bats stranded more runners than Hurricane Katrina did civilians. And the base running skills that this underachieving team displayed daily should be an example to every little league team across America of how NOT to run the bases. Cardinal runners seemed more lost than President Obama without a teleprompter. This is a team that just could never put it all together for sustained portions of calendar time. Their record against pennant contending teams Atlanta, Cincinnati and San Diego was 22-11. So that leads St. Louis Cardinal faithful to believe that this team could be motivated when it wanted to be. That's the problem. Why weren't they motivated the entire season? I know that 162 games is a grueling task and there will be times when your best is left outside of the park, but championship contenders must defeat inferior teams. Motivation is a mystery to this Cardinal squad. An article in the St. Louis Post Dispatch today mentioned that Matt Holliday may de-throne Albert Pujols as team batting leader for the first time ever during Albert's residency here in town. You know what I say to that? So what? Where was Mr. Holliday's bat before the All Star Break? He has had a career long history of being a second half player, but why? Is he not motivated in the Springtime? Does he only heat up with the weather. Well if I were Scott Boras, Holliday's agent, I would have tried to get Arizona to sign him to a one year deal so that he could put together an entire season of excellence, not just 3 months. Then Matt could take his part time talents to New York to disappoint the Yankee faithful for half a season, then hit when nothing is on the line. Albert's greatness is that he does it all season long, every season. Though this year has seen more tough at bats for Pujol's and some extended slumps, no matter who leads the team in average at season's end there will still be no question of who is the real team leader. 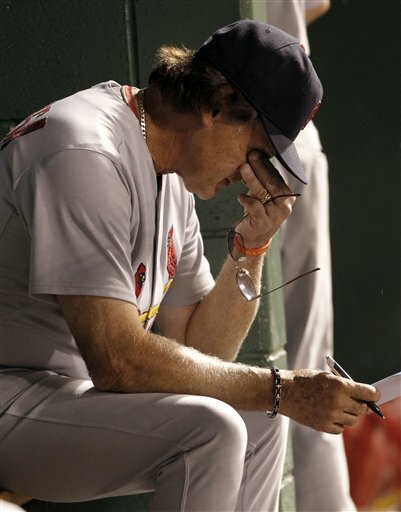 Then there is the Colby Rasmus ordeal with LaRussa. It hauntingly reminds me of the J.D. Drew saga. Both players were coddled on their way up to the big leagues and when things didn't always go their way they sit the bench complaining of nagging bumps and bruises. Don't get me wrong, I believe Tony should have played Rasmus more consistently throughout the season, but it is the young players responsibility to accept his role on the team as the manager makes the calls. Colby may or may not have been treated fairly, but tough noodles. You have to take your bumps as any young professional will tell you, climb your way up the ladder and earn respect and playing time. Note that Rasmus seemed to get very motivated when he played in his home state of Georgia and since then has shed a light on what he can do as an everyday player. And like Holliday, he needs to be able to do that for an entire season. What is sad is that this pitching staff will go down as one of the most under appreciated and undervalued collections of moundsmen that the Cardinals have ever assembled. They may have faltered a bit during the last month, but if not for the horrendous lack of run support Redbird pitchers would be the talk of baseball. Sporting a team E.R.A. of 3.61 Cardinal pitchers had allowed this team to be pennant contenders up until the beginning of September. Imagine if the brittle Brad Penny could have stayed healthy and on track all year long. Jaime Garcia could still warrant serious Rookie of the Year consideration with a 13-8 record and a ridiculously low earned run average of 2.70. Though Cris Carpenter may not have had his very best stuff this year, he being the resident bulldog of the clubhouse has still constructed a fine E.R.A. of 3.21 and a 15-8 mark on guts and guile alone. And of course the new ace of the staff Adam Wainwright. His 19-11 record should be even better considering his gaudy 2.45 E.R.A. that he has managed to post. Minus a handful of rough outings, Wainwrights statistics would have been even more impressive. I truly hope he wins number 20. He definitely deserves it. This team has been an enigma, wrapped in a riddle and enveloped in Morse Code. They have for brief moments been the team St. Louis expected, but more often than not they have disappointed themselves and their loyal fanbase. Because team success at the big league level is not accumulated in Batting Crowns, MVP's, or Cy Young Awards, but in Championships. And the window for success is only opened for so long in today's Major Leagues. Budget constrictions, free agency and age all will play a big hand in what product takes the field next season at Busch Stadium. This year will go down as a season lost. But lost to what? No one can be sure. What St. Louis can be sure of is that there are only so many seasons left with a roster full of Cy Young candidates and Triple Crown threats. It would be a pity to waste anymore.